This article from our old site was written by Scott Meister. With today’s bleak future for fuel, we must start planning wisely. In today’s society, most people now living in urban areas are dependent upon the municipal, industrial and commercial structure to provide for their energy needs. This dependence has removed much of our freedom, for we are at the mercy of those who own or control the fossil fuels that we depend on. At this point, we have a choice. We can go to war to secure the last few drops of fossil fuel energy, and destroy the world, freedom and life on the planet in the process, or we can start living wisely and self-sufficiently, so we are no longer subject to the whims of government or those who “own” fossil fuel sources. Furthermore, if we sever ourselves from this dependence, we will no longer be feeding the greed of the upper, say, two percent of society that is in “possession” of those natural recourses. It is both wise and intelligent to start reducing the amount of energy we need to live on, while at the same time taking steps to provide that energy for ourselves while using that energy in the most efficient way possible. The first steps toward this kind of self-sufficient independence and freedom begin at home. First, we must begin with the intelligent design of a low-input house that takes advantage of passive-solar heating and cooling, and combine it with a surrounding landscape that will provide for our nutrition and any energy-input needs. Those who are unfortunate enough to live in the energy intensive cold-temperate climate are at a specific disadvantage. Before the arrival of Europeans in the midwestern area, people roamed through it seasonally as nomads, wisely realizing that settling in the area would require all of the trees to simply survive the winter. Some have suggested this is why the midwest is so sparse with trees in the first place, thus, the land is not as rich as other areas. Just as some have laid blame on the Anasazi for the deserts around Mesa Verde. Making clearings for the sake of agriculture to support permanent settlements removed the shelter, shade and water regulation needed for the continued survival of vegetation in the area. The hot summers further aggravate the situation in the areas furthest from the coasts. This forces us to design for both extremes. It would be much easier to design for a place that is always cold, or always hot, but in the heartland of the U.S. we have been forsaken to have to deal with both. The main problem, is that we most likely will not be able to keep warm through the winter by simply making use of insulation, orienting the house toward the sun for passive solar heating, and attaching greenhouses (tactics of which non are currently being used. Due to the pioneer paranoia of indians attacking, all settlements have been designed with a wagon wheel back-to-back square or circular design, ignoring sun aspect. If you add the former “abundance” of cheap energy, and aesthetic design customs which are dictated by the drive toward and show of status you end up the modern midwestern suburb). As of now, many of the houses were not designed to survive a world running short of energy. They are, in -fact, aimed entirely toward the opposite goal, consumption of massive amounts of embodied and fossil fuel energy. Vaulted ceilings (being pushed by architecture firms today) require massive heating and air-conditioning. Massive decorative grass lawns require insane amounts of time, labor, oil and gas inputs for mowing, fertilization and pest control (not to mention waste disposal). These are the status symbols of suburban life. They are the coveted norm. This is all going to change, whether we like it to or not. As the price of energy rises, as it has no choice but to do, these lifestyles will slowly become obsolete. Since the winter weather is so harsh, and the summers are so blistering, we must turn toward a more harmonious inclusion of nature in our immediate surroundings and our settlements if we wish to survive without the benefit of cheap fossil energy. In the future, living trees and shrubs will be the main source for what little fuel inputs we will depend on for our new eco-friendly homes. Trees will be the main source of shade to keep us cool in the sweltering summers. Trees will be the main source of soil building as well as water and soil conservation partners. We will slowly start to see the disappearance of the aesthetic fireplace, that heats a small area while actually cooling the rest of the house. Franklin-stoves (which do little better than a fireplace) will fall by the wayside. Instead, we will see a wise homeowner installing masonry stoves that build and trap heat from small fires for the slow radiation of it over time thus making better use of whatever fuel we put into it. To be most thoroughly efficient however, we must use efficient fuel, wisely. We wouldn’t want to burn something that will not last long enough to build up the heat we need, thus requiring large amounts of wood to feed the masonry stove. This would further add CO2 emissions to the atmosphere, while not really contributing to our heating needs. We also don’t want to harvest trees in an unsustainable way by planting lots of pine trees that grow fast, and then simply cut them down and replanting. This would be too energy and time intensive. This growing to kill system just doesn’t make sense when it comes to time use and yield. It is with this in mind, that I’ve decided to do some research into the best kinds of wood for providing heat. I went in search of the tree that would give off the highest amount of BTU’s per cord. It is this search that lead me to the information below that was provided by a study done by the University of Nebraska-Lincoln Extension, Institute of Agriculture and Natural Resources. I also consulted a study published by the University of Missouri-Columbia along with various other online resources. I chose the Top 10 BTU producing trees from these studies in hopes that we would all consider planting bio-diverse hedgerows, food-forests, shade trees, swale tree-lines with nitrogen-fixers that can also act as coppiceable sources of fuel. By including a variety of these trees, in combination with a passive solar home properly shaded in summer, using a masonry stove to maximize the efficiency of our fuel trees in winter, we can wean ourselves from dependence on the system, and on the fossil fuel cartels at work both at home and abroad. By providing our own food and energy security, we thereby will increase our own independence and freedom, thereby truly living the “American” dream. Without further ado…the Top 10 trees are (drum-roll here)………. Three Cheers for Osage Orange! I’d like to spend some time talking about some of the better fuel woods up on this list, specifically , Osage Orange (Maclura pomifera). Look at that number again…32.9 million BTU’S per cord. That’s the next best thing to coal! Another paper from the University of Missouri-Columbia stated that Osage Orange would produce 30.7 million Btu/cord. This would equal (and here’s the interesting part) 219.3 gallons of Fuel Oil. Considering that 1 barrel of oil produces 9 gallons of fuel oil, and one barrel of oil is priced currently at $67 US. Then one cord of Osage Orange is worth $1,634.80. Since it generally takes 4 to 10 hours of work to harvest, haul and prepare a firewood cord, in terms of labor, this would translate into between $163.48 /hr and $408.70/hr (depending on your planning and efficiency). NICE WORK IF YOU CAN GET IT! And…if the trees are coppiced in rotations, this would be sustainable! In other financial terms, one cord of Osage Orange is about 4,728 lbs. (dry weight). This would mean you could get about $3.00/lb. Considering the ever rising price of oil…ick! This tree is going to just become more valuable, especially since it’s not very popular right now, and people seem to just want to stick it in the ground dead as fence-post…more on this later. 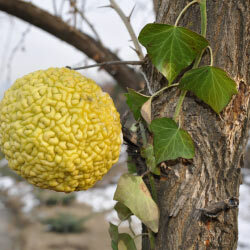 Osage Orange (also commonly known as Hedge apple or just Hedge) got it’s name from the the tribe that live in an area around Arkansas, the Red River Valleys of southern Oklahoma and northern Texas. The Osage Indians valued the tree’s wood for it’s strength and elasticity and therefore used it to make bows, clubs and other tools (it’s still being used for this purpose today (well, bows at least, I don’t know how many people are making war clubs today). My father was recently bragging on it’s behalf in terms of its woodworking value. It has a beautiful fine grain and a yellowish-orange tint. It’s gorgeous and as it dries, it becomes extremely hard. Greener Osage Orange is easier to work with. Attempting to put a nail into dried, cured hedged takes a bit of effort. I bent many a nail in dried and cured pieces of Osage Orange while playing around in my uncles workshop. When I was a child of about eight years old (I think), I watched as my father and uncle built a barbed wire fence with Osage Orange as posts. Untreated, thirty years later…those posts are still in the ground, rot-free and untouched by termites. It’s actually because of the invention of barbed-wire (and a bit of shortsightedness on the side of humans today) that Osage Orange is becoming more scarce, and being used as dead fence-posts and un-coppiced firewood, instead of a living hedge and a sustainable source of fuel. To be frank, we humans have a bad habit of valuing things more when they are dead than alive…a habit we must drop. The capitalist corporate mind looks at forests and sees clearings for subdivisions and measure it in board feet, or they see cabinets and fence posts. Unfortunately, they no longer see the rain makers, shade givers, shelter, temperature and water regulators, air filters and air-combs, soil builders and nitrogen fixers. They see the forests use only after it is dead and gone. Before 1874 when barbed wire was invented, Osage Orange was better known as the hedge-tree. Pioneers valued it highly as a living hedge, and planted them close together, taking advantage of it’s tolerance to severe pruning, and ability to be coppiced in order to make strong, long lasting, hedges that were “Horse high, bull strong and hog tight.” In other words, tall enough that a horse couldn’t jump it, strong enough that a bull couldn’t push through it and interwoven so tightly that even a hog couldn’t get through. The thorns it produces takes care of discouraging most animals, including the most dangerous one on earth, the human. Due to the gnarly appearance of such hedges, many have evidently come to see it as an “ugly weed tree.” How disappointingly shameful. If Osage Orange trees are planted out in the open (a situation formerly common on the great-plains) they grow like a shrub. If they are close enough to each other, they will become intertwined to create one of the best living hedges known to man. We might further argue that it’s even better than barbed wire, and much more sustainable to boot considering it’s lighter embodied energy audit. If Osage Orange trees are grown amongst other woodland competition, or coppiced with proper management, they can grow very tall and straight with the tallest recorded height being 54 feet with a span of 90 feet. On a historical note that tree was grown from fruit sent back by Lewis and Clark from seed which was planted by Patrick Henry’s daughter at Red Hill in Virginia. In fact, Osage Orange was the first tree that Lewis and Clarke sent back from St. Louis. The fruit of the tree is a large, green, wrinkled ball with a fragrance like an orange peel (hence the name) that will often stay on the tree after it has lost most of its’ leaves in the autumn. Squirrels go NUTS for the multiple seeds buried inside, and will spend quality time at the base of a tree to disassemble a fruit into bits just to get to all of them. Horses and other livestock enjoy the fruit, although it’s not recommended for humans, as it’s “harsh, hard, dry and astringent.” [Permaculture Info Web] However, it does contain an antioxidant which can be used as a food preservative, especially for oils. “The heartwood and the root can yield a nontoxic antibiotic that is useful as a food preservative.” [PIW] The fruit can also be used as an insect repellant because it contains the chemicals (2,3,4,5-tetrahydroxystilbene) . By cutting one into wedges and setting them on a plate, the fruit sap will repel cockroaches, crickets, spiders, fleas, box elder bugs and ants. If you want to skip the hassle of trying to dig into one of these with a knife, just drive over it with your car…you’ll still get the desired result, although it won’t look as pretty. On a side note, anyone wishing to be “Johnny Hedge apple Seed” might want to plant both male and female trees so that trees will bear fruit, thus giving us more seeds, and trees to replace the thousands who have fallen due to mankind’s’ shortsightedness. All this information is nice but now let’s get on with the matter at hand. Fuel…32 million BTU’s per cord. That’s virtually twice the average of most trees, and I will repeat: it’s the closest you’re going to get to coal with wood. Why, in this energy scarce day, would we want to rid ourselves of such a valuable fuel source and waste it on fence posts, shelves and decorative bowls? I guess, because we dangerous humans are idiots. If we are going to insist on living in an energy intensive cool/cold-temperate climate, and wish to survive the winter without the advantage of cheap oil, natural gas and electricity. We might want to consider the following. Rip out our aesthetically pleasing, yet highly inefficient fireplaces and franklin stoves. Especially those that are using natural gas. As natural gas has peaked and it’s going to continue to increase in price, along with oil. Fireplaces, and even the slightly more efficient franklin’ stoves do not do much to heat the house, but they do an efficient job of sucking in cold air from the outside, and throwing up a bunch of carbon-dioxide emissions into the air. Just like the suburban lawn, these serve no practical purpose. They are a massive waste of resources for the sake of an aesthetic show of wealth. If we truly want to keep warm in an efficient manner, I would suggest installing a well-built, and well-placed masonry stove. With one of these, you could stock a really hot fire of Osage Orange, let it burn out, and the heat will radiate from the masonry throughout the rest of the day. Using a bio-diverse, coppiced, high BTU fuel forest will save you a lot of woodcutting and hauling labor because you will need less wood to provide your heating needs. Furthermore, you will have a higher yield of wood over time for your efforts. Keep in mind, that Osage Orange burns hot, but slow, and therefore starts slow (as most hard wood-high BTU producing woods do). You will need some serious kindling to get that baby goin’. This means planting more trees. The more the merrier! For kindling, I suggest trying Aspen, Basswood, Cottonwood, Yellow Poplar or Eastern Red Cedar. These quick burners. So, we continue planting a bio-diverse fuel forest. A good number of Osage Orange and a few other species from this list above, along with some of the kindling species mentioned should keep you set. You could even harvest and make bundles of Osage-Orange twigs instead of logs that will get the fire burnin’ hot and bright. Speaking of which, the aesthetic value of burning hedged is almost priceless. It gives off a slight fragrance, and a colorful light show of flames accompanied by a crackle and a small concert of pops of sparks (the sparks are small, and usually burn out before hitting the ground thus don’t usually cause damage, but better safe than sorry, and not use it in an open-faced fireplace or stove, just one more reason to opt for a masonry stove). So, just to recap, Osage Orange planted and coppiced for fuel is our energy efficient ticket to surviving the winter in a cold-temperate climate. Oh… and I almost forgot one of the most important things. It’s hardy to zone 5, succeeds in poor soils (especially dry ones) therefore being drought resistant, and fairly tolerant of maritime exposure. One slight word of warning too: the milky sap from the tree can cause dermatitis in some people, so be careful when harvesting, you’ll want to wear gloves anyway due to the thorns. Hmmm, there’s another use, security barrier! How many trees will you need? This, of course, depends on if you’ve wisely followed the advice above, and have a masonry stove (better yet, having it installed in a passive solar straw-bale or earthbag house built toward sun aspect) with the proper amount of windows on proper sides and with sufficient awning or roof overhang to allow winter sun onto a radiant heat mass while also keeping the summer sun off your outside walls. If you’re simply going to go for a cord, here is the Firewood cutter’s rule of thumb. Now unless you’re a lumberjack, or semipro wood cutter, you’re probably wondering what the blazes is a DBH. That stands for diameter at breast height, taken by measuring a tree’s diameter at about 4 1/2 feet from the ground. Now, this list only goes up to 6 DBH for one reason. Most trees are coppiceable if they are less than 6 inches in diameter and less than 10 feet tall. Therefore, if we want the tree to survive and continue providing us with firewood in a sustainable manner, we don’t want to let it grow bigger than that. So, we will need, on average, about 34 of the above trees to produce one cord of firewood (if that is the amount you really need). I would suggest more, as we are going to coppice them on rotation. The average by today’s standard home (considering the average home is lacking sufficient insulation, has ceilings too high, and if it has a fireplace or stove, it’s inefficient) needs 4 1/2 to seven full cords of wood per year to heat. I will be bold here and state that this is probably due to the fact that modern structures aren’t built toward energy efficiency, and most people don’t burn wood that kicks out a high BTU. The common, lazy fire builder usually goes for lighter, faster burning woods. I will further venture to make a brave guess, that a straw-bale or earthbag home properly designed and placed to take advantage of passive solar heat, with a masonry stove burning Osage Orange will only need one or two cords per year maximum. However, I have yet to see anyone that has done this. I might also add, that the above numbers were probably taken from trees that weren’t coppiced, therefore the amount of wood harvested from those trees will have been much, much less, especially over time. So there seems to be an open debate as to whether or not this tree is Nitrogen Fixing. Even if it is, it seems to impoverish the soil, and exhibits some antisocial behavior not suitable to a bio-diverse well stacked planting. White Oak (Quercus alba) has 9 uses including edible seed that can be used as a caffeine-free coffee substitute. It’s is hardy to zone 4, and is Lime tolerant as well as side-shade tolerant. A mulch of leaves repels slugs and grubs although fresh leaves shouldn’t be used, as they can inhibit the growth of other plants. Black Locust (Robinia pseudoacacia) (see above warning) is a fast growing deciduous tree that withstands drought and tolerates poor soil while being hardy to zone 3. It brags of about 25 uses including edible seed and seed pod, can be used as a drink and has fragrant vanilla-like scented flowers. Beware that the branches are brittle and subject to wind-damage. Ironwood (Ostrya virginiana) is a slow growing deciduous tree that is hardy to zone 4 and doesn’t demand much light. A decoction of the bark can be used medicinally to bathe sore muscles, and an infusion of the bark can be held in the mouth to relieve toothache pain. Good fuel, but very difficult to split, so if you want your kid to have big strong muscles, and work on their temper, or if they need to blow off some steam… get them to do the splitting (under close supervision). Shagbark hickory (Carya ovata) is “a slow growing deciduous tree… [but] is the fastest growing hickory in N. America” (PIW) hardy to zone 4. It’s seeds can be eaten raw or cooked and are used in pies, cakes and bread. Medicinally, the fresh small shoots can be steamed to make an inhalant for the treatment of headaches. It also produces an excellent charcoal. Apple (Malus comestica) needs almost no introduction, and there’s so much information out there already, I won’t go in to any further detail here. However it is hardy to zone 3, withstands frost, and seems to be able to grow well near a wall or in the secondary layer, or in woodland gardens. It’s ability to grow close to walls may offer you the benefit of giving you a fuel and food source in zone I near the house. Honey Locust (Gleditsia triacanthos) is a deciduous tree hardy to zone 3 that withstands drought and poor soil (including saline soil) making it ideal for soil reclamation projects. The seeds have many edible and medicinal uses. Bitternut (Carya cordiformis) is the tree for you if you have a boggy swamp area. It’s a slow growing deciduous tree that is hardy to zone 4 and succeeds in low wet to dry woods, stream banks and on the borders of swamps. Produces seeds that are edible, but even squirrels don’t seem to like it much (according to PIW). Last, but not least, we have the beloved and highly edible Mulberry (Morus species): a deciduous tree that might do well in the second layer in the canopy or in a woodland garden. 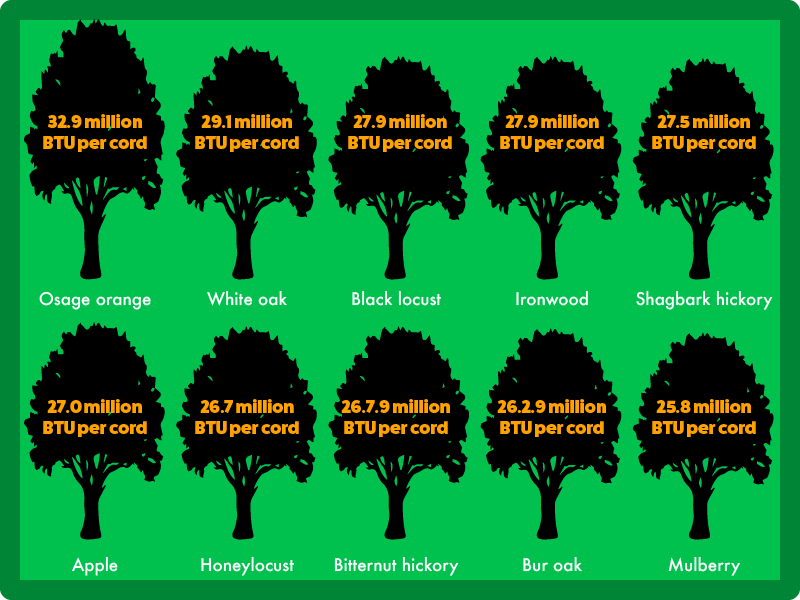 Often grown for the fruit, it’s often looked over as a fuel source – afterall 25.8 million BTU’s per cord ain’t bad. It certainly isn’t anything close to Osage Orange, but it’s still in the top 10. It’s a good addition to any bio-diverse planting as it also gives you the added benefit of edible fruit. Although I’ve spent a great deal of time concentrating on Osage Orange, I can’t emphasize enough the need for bio-diverse plantings. Most of these high BTU trees are slow growing, this is one more reason to coppice, and mix up your fuel forest with a variety of trees to help you get through the winter. I would also like to suggest that we take a good serious look at the way we use our trees. Do we value them alive or dead? Do we wish to get the most out of them? If so, then we must use them wisely, as both a windbreak, hedgerow, shade giver, soil stabilizer as well as a source for fuel and food. We must also carefully look at how we use our lumber. Are we really going to use Osage Orange to make a bunch of decorative pens, jewelry boxes or pen holders? To me, this is somewhat similar to the executive who spends thousands of dollars on a platinum umbrella stand. We could be better use Osage Orange to take advantage of it’s rot resistance in the form of outdoor structures, door frames, planter-boxes and trellises, or perhaps bowls and cups? If we wish to get the most out of whatever resources we have, we have to use them wisely and use their advantages to our advantage. Finally, trees are not just lumber and firewood. They are a part of this living ecosystem that we depend on for our survival. They aren’t of much use to us dead. There seems to be a prevailing attitude that cutting down (and thus killing) a full grown tree is the best way to serve mankind. The support for this argument is that you get “more” wood from the tree and large, wide pieces of lumber, or more “board-feet.” This thinking is fundamentally flawed. First of all, you get a greater yield over time, if you sustainably harvest from a coppiced or pollarded tree. Secondly, why do we need large pieces of lumber? Isn’t it true that anything that needs to be made big, can be made by joining many smaller pieces of wood together? Let’s save cutting down full-grown trees for those who’s time has come from old age, have succumbed to illness, or are creating a hazard. The indiscriminate hacking down trees for our own selfish purposes is doing more harm than good. For your own safety, please, please, please learn from someone who knows what they’re doing when felling a tree. Use a good quality saw with good sharp blades (it will save you a lot of effort, wear and tear on the body, and swear words). Carefully consider wind direction, natural lean and balance of the tree, location of large limbs, and the surrounding area where the tree is likely to fall. Make sure the area around the tree is clear of brush, and make an escape safety zone. Be sure to back far away from the stump so the trunk doesn’t kick off and hit you when it falls. Trees don’t always fall the way you want them to (see story below). If a tree becomes lodged in another tree while falling, the safest way to get the tree down is to pull it away from the other tree with a tractor or winch. Never attempt to cut the tree in which the felled tree is lodged, and never try to climb the tree either. Always move away at a 45-degree angle from the direction of the falling tree to the side and rear of the tree as it falls. Once, I was felling a tree on my in-law’s property, about a 30-40 ft evergreen. I didn’t take into consideration the wind direction because I was down in a sheltered area, while the tree top was up above in the mountainous winds around Mt. Fuji. Furthermore, I didn’t make my undercut or back-cut properly and carefully as I was in a hurry (big mistake number one: never hurry) When the tree started to fall, it went the opposite way toward a steel fence surrounding a turf tennis-court. A nightmare of expensive damage flashed through my mind, and I jumped between the tree and the fence (big mistake number two), put my feet back on the fence and put all my weight (all 130 lbs of me) pushing against the tree in hopes I could offset the wind, and get it to fall in the proper direction. I got the tree to stop falling, but couldn’t offset the wind. I was quickly becoming tired, and was thinking about how to get myself out of this situation. Luckily, my wife, and mother-in-law came around to see how things were going, and they were silly enough to endanger themselves to run over and help me, and we got the tree to fall the proper direction. This was insanely stupid. damage of property is always more welcome than causing physical damage to yourself and loved ones. Never hurry, and plan ahead carefully. Hopefully, we’ll all coppice trees less than 10 ft. tall and less than 6 inches in diameter, so we won’t ever be in such a situation…but remember. SAFETY FIRST! The above information was based on a report entitled “Heating With Wood: Producing, Harvesting and Processing Firewood” Published by the University of Nebraska-Lincoln Extension, Institute of Agriculture and Natural Resources written by Scott DeWald, District Extension Forester; Scott Josiah, Director, Nebraska Forest Service; Becky Erdkamp, Publications Assistant); a research paper entitled Wood Fuel For Heating by John P. Slusher, School of Natural Resources published by University Extension, University of Missouri-Columbia and various information available on the Permaculture Info Web (http://permaculture.info/index.php) and the experience and observations of Scott A. Meister. confusion reigns !!! but good article !! Black locust is a proven nitro-fixer .Honeylocust (Gleditsia)is the deadbeat legume that has lost the ability .